In 2007, the story of Greensburg, KS became one of national significance when an EF5 tornado claimed 11 lives and destroyed 95% of the community. In the aftermath, survivors showed incredible bravery and commitment to rebuild. Health Facilities Group’s design of Greensburg’s replacement hospital is but one of the countless narratives of rebirth made possible by the people of Greensburg. Already under contract for master planning before the storm, HFG COO David Wright’s first view of the devastation came two days after the tornado during recovery efforts. Initial planning meetings occurred in a M*A*S*H hospital supplied by the National Guard. Over the course of the project, HFG’s design team witnessed the gradual reanimation of Greensburg with restaurants and other commercial enterprises. The community also united around a green, technology-driven vision of identity, which HFG helped to fulfill by designing the nation’s first LEED Platinum Critical Access Hospital. The extraordinary circumstances surrounding this design and planning project were some of the most challenging that HFG has encountered. However, meeting these difficult demands and seeing the restoration of Greensburg were equally rewarding. This project continues to inform our approach to facilitating dialogue, mobilizing stakeholders, and engaging communities. As a result of our work in Greensburg, HFG is better equipped to leverage technology and environmental sustainability to improve overall efficiency and performance. Today, the Kiowa County Memorial Hospital features locally sourced bedrock limestone. After all, even as the town of Greensburg was leveled, its foundation held firm. Through its work in Greensburg, KS, Health Facilities Group developed proficiencies and expertise that remain relevant today. In designing the nation’s first LEED Platinum Critical Access Hospital, HFG had to pilot new sourcing and engineering methods without the guidance of precedent. HFG’s 50,000 SF sustainable design included two wind turbines, a frictionless chiller, extensive water capture and reuse, and broad use of natural day lighting. HFG continues to use many of these systems not only for clients pursuing LEED certification, but also for hospitals pursuing cost efficiency. Greensburg’s hospital operates as a community hub by providing multiple services. 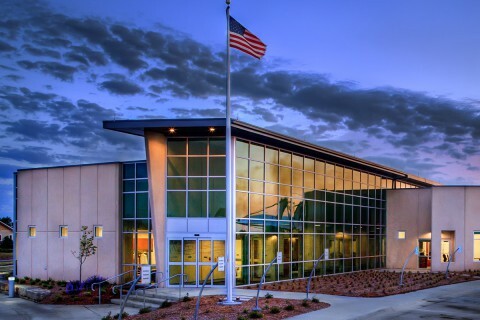 HFG designed to accommodate imaging; emergency services; laboratory and acute care patient services; outpatient physical therapy; local provider offices; a family practice specialty clinic that incorporates areas for ophthalmology and dentistry; a wellness center; day care facility; and storm shelter. HFG’s experience has made it an expert in fulfilling overlapping needs through multifunctional spaces.